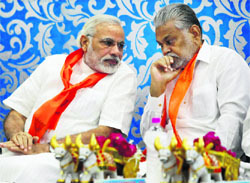 The BJP seems set to declare Gujarat Chief Minister Narendra Modi as the party�s prime ministerial candidate in spite of vehement opposition by party patriarch LK Advani. In a setback to the Uttar Pradesh government, the Supreme Court today rejected its plea against involving the Centre in two PILs over the Muzaffarnagar violence. A Central team of experts that visited the Muktsar belt, one of the best cotton-producing areas in the region, has concluded that excessive irrigation, faulty alignment of drains and a wrong cropping pattern are responsible for persistent waterlogging in the area. The Punjab and Haryana High Court has prescribed video conferencing for recording the evidence of medical experts; and has directed the setting up of video conferencing rooms in civil hospitals. Facing allegations of having a hand in his wife's murder, Gurgaon Chief Judicial Magistrate Ravneet Garg was today transferred to Jagadhri. The transfer comes less than two months after his wife Geetanjali was found murdered. A majority of newly elected mayors and councillors of municipal corporations in Haryana are unhappy with the lack of administrative or financial powers to corporations. While the 74th Constitutional Amendment provides for empowering urban local bodies, the provision has not been implemented on the ground. 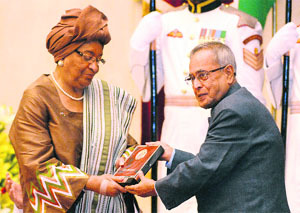 President Pranab Mukherjee today presented the 2012 Indira Gandhi Prize for Peace, Disarmament and Development to Liberian President Ellen Johnson Sirleaf. She was honoured for serving as an example and an inspiration for ensuring the return of peace, democracy, development, security and order in her tiny West African nation.